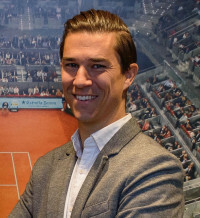 Antonio Arenas (Madrid, 1984) is communications director for the Mutua Madrid Open, a television channel that employees him as a special correspondent in such tournaments as the Australia Open, the Roland Garros, and the US Open. Present at the most important events on the circuit, he has been able to live and tell from up close Nadal’s and Federer’s achievements in recent years. He was a presenter on Tie Break, the first radio tennis program, and his enterprising spirit led him to found the thematic channel Setball Radio and to cofound the webpage Tennistopic.